It’s been snowing off and on for the last few days. In self-defense, we’ve kept a roaring fire going, a not-insignificant accomplishment since we’ve been burning green wood.By Saturday afternoon, we had an impressive bank of coals in the fireplace, just right for grilling thick Tuscan-style steak. We headed out to the store to buy the best steaks we could find.We rarely eat big chunks of meat, so in honor of the decadent occasion, we decided to throw dietary caution to the wind. 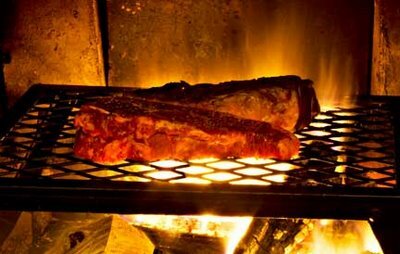 I mixed up a compound butter seasoned with Roquefort, rosemary, and garlic to top the steak.For fireplace grilling, we use a simple folding grate and set it up directly over very hot coals. If the fire is flaming, all the better; just be sure to turn the meat often so it doesn’t burn (long tongs are perfect for this task). To accompany the steaks, I made simple Oven-Roasted Potatoes. These are the potatoes I turn to when I need to cook potatoes at the last minute and want something fast and reliably delicious. The potatoes are great for mopping up the melted Roquefort-Rosemary Butter and meat juices left on the plate when you’ve had your fill of steak (don’t feel obligated to eat the whole steak; it makes terrific left-overs).